While the risks of human infection from the HPAI H5 viruses that arrived last winter in North America are considered low, they are not zero. These HPAI H5 viruses are all related to strains that have - in other regions of the world - caused serious and even fatal infection in humans. Add in the fact that influenza viruses constantly mutate and evolve, simply assuming these viruses to be 100% benign is unwise, regardless of their performance to date. We've been fortunate so far this fall, but the expectation remains that we are likely to see additional outbreaks of HPAI H5 in this country in the months ahead. Many people working on these farms, particularly culling and response teams, will have an enhanced potential to be exposed to these viruses. Yesterday the CDC published new, updated guidance for A) Clinicians evaluating & treating exposed individuals and B) Self-Observation Instructions for HPAI Responders. This document summarizes important clinical information related to HPAI H5 and CDC’s recommendations for patient evaluation, treatment, and testing. Avian influenza viruses occur naturally among wild aquatic birds worldwide and can infect domestic poultry and other bird and animal species. Outbreaks of avian influenza happen in birds (including domesticated poultry) from time to time. Some of these avian influenza viruses are more lethal to poultry (highly pathogenic), while others cause no illness or only mild illness in poultry. There are standard containment and control practices for HPAI H5 outbreaks in poultry when they occur. 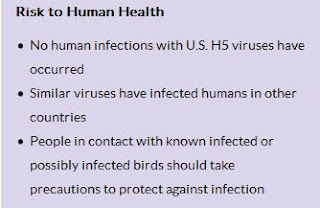 During 2014-2015, outbreaks of highly pathogenic avian influenza A H5 (HPAI H5) occurred in wild birds and poultry in the United States. * While no human infections with these HPAI outbreaks have been detected, rare human infections with other avian influenza viruses have occurred and it is possible that people may be infected by these viruses. In particular, people involved in HPAI H5 poultry outbreak response activities and others with exposures to infected birds or surfaces contaminated by feces from infected birds may be at risk of HPAI H5 virus infection. All HPAI H5 outbreak responders, including those who used personal protective equipment (PPE), are being asked to self-observe for signs and symptoms consistent with influenza on a daily basis and to call their health department if they develop compatible illness. Health departments may ask responders to seek care and/or testing for influenza A virus infection, including testing for H5 virus. Treatment recommendations: Initiation of antiviral treatment with a neuraminidase inhibitor is recommended as early as possible for any patient with suspected or confirmed HPAI H5 virus infection. This includes patients who are confirmed cases, probable cases, or cases under investigation, even if more than 48 hours has elapsed since illness onset and regardless of illness severity. Treatment with oral or enterically administered oseltamivir is recommended. Antiviral treatment should not be delayed while waiting for laboratory test results. If molecular testing is negative for HPAI H5 virus and other influenza viruses, and HPAI H5 virus infection is still suspected in a patient who is severely ill, antiviral treatment should be continued and additional respiratory specimens should be collected for repeat testing. For patients who are not hospitalized, if molecular testing is negative for HPAI H5 virus and other influenza viruses, neuraminidase inhibitor treatment can be discontinued. For more information on treatment recommendations, please visit http://www.cdc.gov/flu/avianflu/novel-av-treatment-guidance.htm.